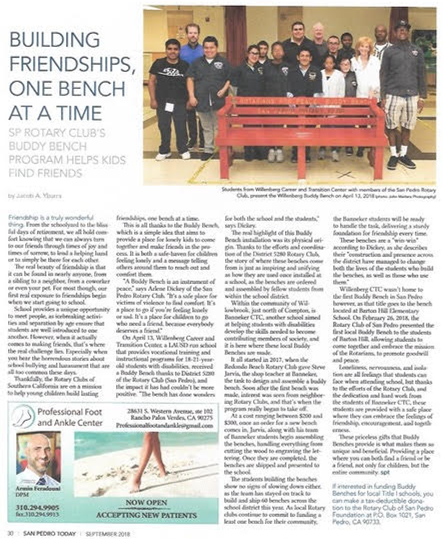 The Rotary Club of San Pedro's Peace/Buddy bench is continuing to make news! This month's San Pedro Today showcases the Peace/Buddy benches and provides a link to donate if you'd like to participate in the movement! Continue reading for even more exciting news about how LA Unified School District is joining the movement! There are seven LA Unified School District (LAUSD) Career and Transition Center programs throughout the District that provide employment preparation, independent living skills, and social skills instruction to students on alternate curriculum ages 18-22 years old. Employment preparation is provided through a variety of vocational training programs offered at the CTC. The vocational training programs provide opportunities for students to gain skills that will make them work-ready and prepare them for competitive or supported employment opportunities after they exit the public school system. Independent living skills instruction, which includes community integration and independent travel, provides opportunities for students to grow and become as independent as possible. The social skills instruction incorporated in each vocational training program allows students to learn and practice appropriate workplace and social behaviors in the context of real world situations and environments. Peace/Buddy benches were made by the students at Banneker CTC. This is a note from the Teacher at Banneker CTC. "I don't think you'll really understand the ramifications of this moment for a few years. Because what you've done is truly amazing. And not JUST to the schools you donate the benches to with the message of peace. But to us at Benjamin Banneker CTC. You're providing us with the opportunity to rewrite our school AND to go from Good To Great. We now have a steady stream of orders, which allows us to be more professional in our approach and it provides us with the resources to present students with a real-life job and work environment. Ask the Schools in your area to see if you can get involved in the movement.